The promise of today’s interconnected world is immeasurable.Technology has become integral to virtually every sector of the global economy, including banking, communications and the electrical grid. The benefits that stem from that promise, however, face very real threats. 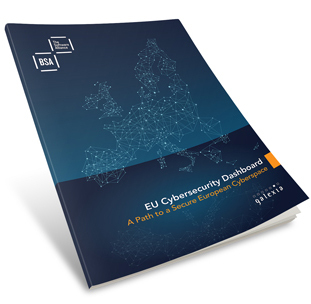 The purpose of this report — the first-of-its-kind BSA EU Cybersecurity Dashboard — is to provide government officials in each of the EU Member States with an opportunity to evaluate their country’s policies against these metrics, as well as their European neighbors. This study is based on an assessment of twenty five criteria across five themes.There are no overall rankings or scores in this study. This analysis is the result of desk-based research on publicly available information, and did not involve direct interviews with national agencies. Where possible we have included links to further information and resources. The research period concluded on 1 January 2015, and general information in the report is correct up to that date.